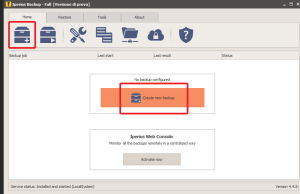 Iperius is a lightweight, powerful and flexible software for Hyper-V backup. In fact, it can make hot backups of Hyper-V virtual machines to multiple destinations, like LTO tape drives or NAS devices, Clouds or FTP, and without any limitation on the number of virtual machines and data size. One license for an unlimited number of virtual machines. Connect to unlimited Hyper-V servers from a single installation without needing any agent. Many destinations allowed: LTO Tape, NAS, FTP, CLOUD (Google Drive, Dropbox, Amazon S3, etc.). Complete utility with many other features, including VMware ESXi and ESXi Free virtual machines backup. 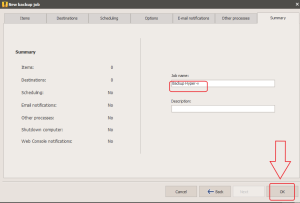 First you have to create an account to connect to the Hyper-V server (that is the local server, where Iperius is installed). To do that, click on the button circled by red in the picture below. Creating an account is very simple: you only need to specify the credentials of a local/domain administrator account (Or those of another user with elevated Hyper-V management permissions). 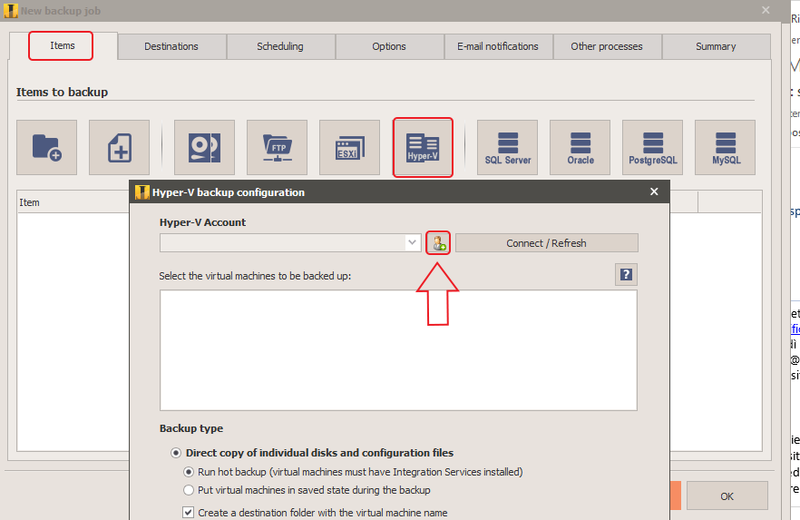 There are few basic settings in the Hyper-V backup configuration. 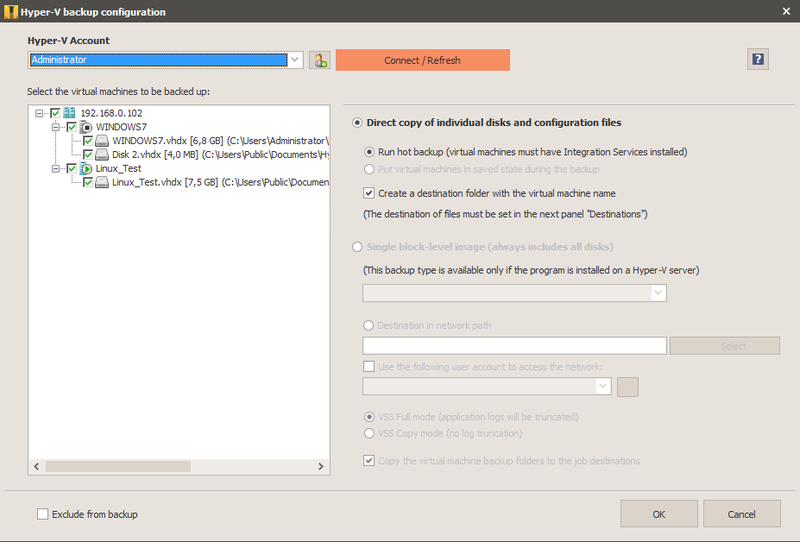 In fact, you have to select one or more virtual machines, and then specify the backup mode: you can choose to create an image backup including all virtual machines and that can be updated incrementally – a block level backup – or you can choose a direct copy of virtual machine files individually, also choosing the disk to backup (the main one is always selected and obviously uncheckable). Using the image backup mode, you will be able to restore virtual machines also using the Windows Server Backup management console, while using the other backup mode you can restore individual virtual machine files manually, simply copying their disk and configuration files to the original folders. Iperius doesn’t use any proprietary format, so virtual machine backups will always be restorable regardless of Iperius, because they’re kept in the standard Microsoft formats. Save the Hyper-V backup item clicking on the OK button. 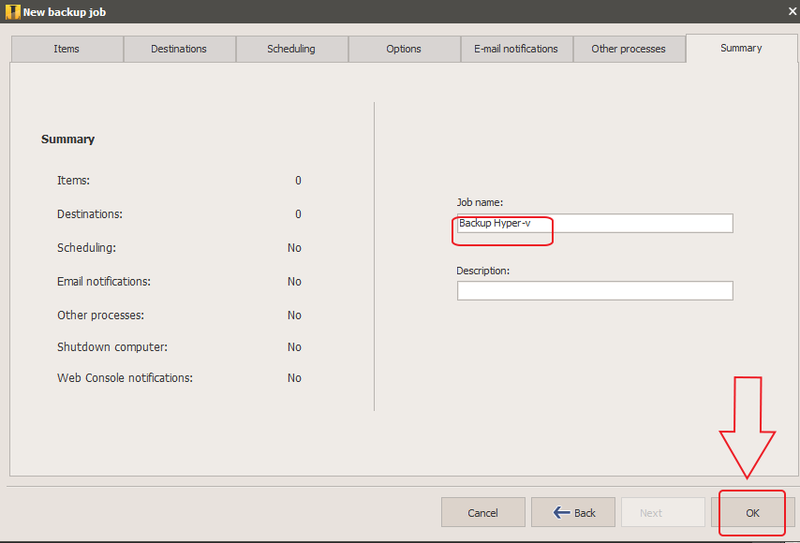 Finally, choose a name for the backup job and save it clicking OK.
Iperius has simple and powerful Hyper-V virtual machine restore capabilities. 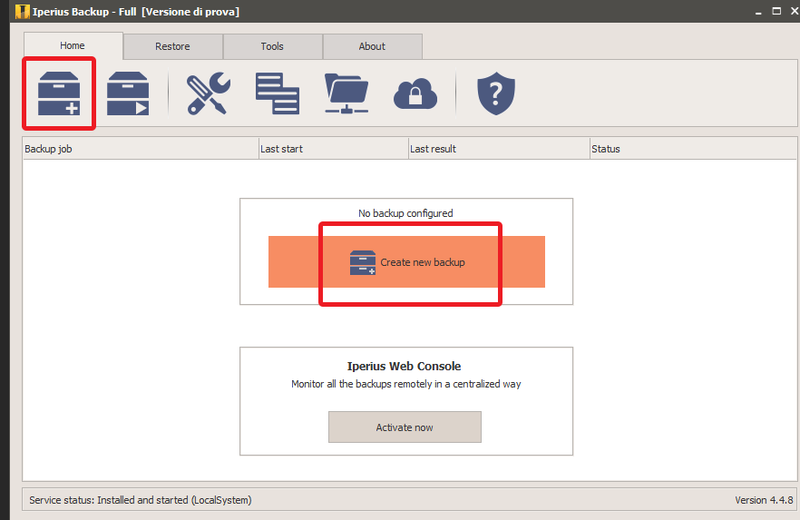 One of Iperius’ best features is the ability to restore virtual machines from another network machine. 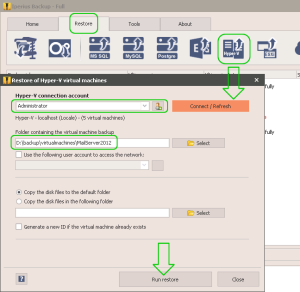 First, you need to create and/or select an account to connect to a Hyper-V host (which can be your local machine or another server on your network) and connect to it. 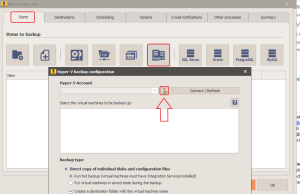 Then select the folder containing the virtual machine backup performed from Iperius. This must obviously be an accessible path (and if it is a network path, an account for auto-authentication in the shared folder may need to be specified). Two more important options must then be defined, i.e. whether to restore the virtual machine (and then the disks) to the Hyper-V default folder or to a specific folder, and whether to generate a new ID for the restored virtual machine if a virtual machine with the same name already exists in the Hyper-V host. At this point, just click on the restore button for Iperius to take care of restoring the virtual machine, completely automatically. 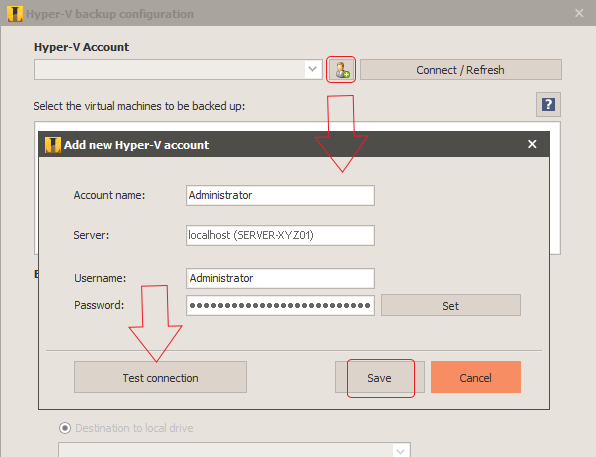 Recovering an Hyper-V virtual machine saved with Iperius is very simple. 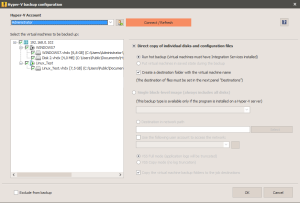 In fact, Iperius saves the virtual machine in its original format (a VHDX image or a simple copy of its VHD/VHDX and XML files), without using any proprietary format. The image backup can be restored using Windows Server Backup as well (you can see and select the virtual machine(s) to be restored from the image). If you made instead a direct backup of individual virtual machine files, you can simply copy back those files in their original folders and start the virtual machine. 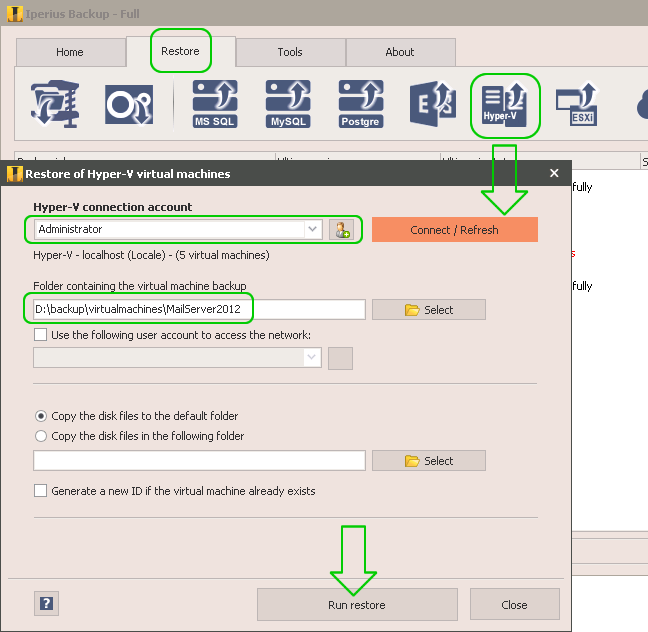 Obviously you can also create a new virtual machine and attach the virtual disk files saved by Iperius. Backup HYPERV directly to ftp won’t work since there is an error in the path created by IperiusBackup. Creating and running the same backup using SMB works fine, but is very slow and unusable for us since we have about 3TB to backup daily. SMB puls only 1MB/s and FTP does on average 80MB/s. what version of Iperius are you using ? Did you contact our technical support from the contatc page on the official website http://www.iperiusbackup.com ? Hyper-V cluster is not fully supported yet. I have 2 Hyper-V servers, and have a tape drive connects to one of the Hyper-V server. 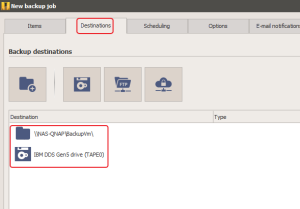 Can I use the iperius backup in the Hyper-V server with tape drive connected to backup VMs locally and VMs on another Hyper-V? You have to install Iperius on both the servers. The server that hasn’t the tape drive installed must make the backup to the other server, to one of its disk or to a NAS. On the second server, you can make the Hyper-V backup directly to the tape, adding also the Hyper-V backup of the other server. I am testing Iperius to back up Hyper-V VMs to Azure. I need incremental backup (of course) in order not to send over the Internet tens of GB and occupy a lot of storage in Azure. Hyper-V in Windows Server 2016 has very complex mechanism for exposing the changed disk blocks that Iperius is hopefully able to benefit of. When I set up the backup destination of my Hyper-V job, the only options I get is “Hyper-V: Create a full backup each time and copy all files”. Is there a way to set up incremental backups for my Hyper-V VMs? currently it is not possible to use the “CBT” technology in Hyper-V 2016 with Iperius, to only back up changed clocks. The incremental backup type is only available when you use the image backup mode, but only to local destinations. The transfer to azure will be still a full backup. The good news is that we’re working to add the support for incremental backup of changed blocks on 2016. Almost surely it will be released this fall. Hi, I’m just trying to test a backup of a hyper-v virtual machine. I installed Iperius on the host and hit the button to try the full version. Then I attempted to setup a backup and created an account to connect to the host admistrator account. That worked but no virtual machines show up in the list to choose for backup. What am I missing please? 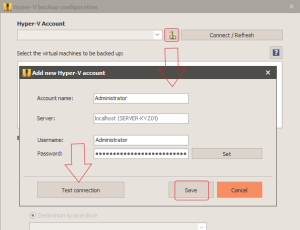 While recovering Hyper V backups from Iperius there is Account connect option coming in iperius its not validating the account i am unable to restore the Hyper backups. We see above that cbt / rct for hyper-v should now be available since fall 2017? We will keep the conversation by ticket.